Monarch Air Group provides private air charter in Sochi, Russia. Our clients benefit from top-notch service, unrelenting dedication to safety, wide selection of aircraft, and years of experience in chartering private jets. To obtain a free quote, please use our online quoting tool provided below, or call toll free 1-877-281-3051. Monarch Air Group offers private jet charter services to and from Sochi, Russia. Often referred to as the “Black Sea Riviera” and the “South Capital of Russia”, Sochi is a port and resort city located in southwestern Russia, on the Black Sea coast of the North Caucasus region. It boasts the wonderful beaches, surrounded by warm clear waters, foothills and mountains, a plenty of mineral springs and flora and fauna kingdoms. 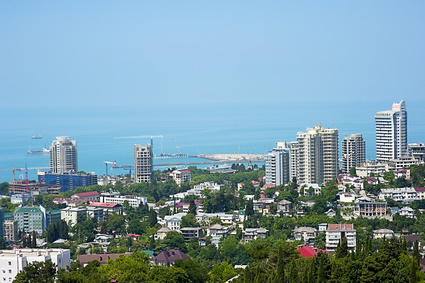 For nearly two centuries Sochi has been a famous Russian resort and enjoyable destination, and nowadays it continues to attract both domestic and international travelers all year around. Over 80% of the territory is the part of the State National Park, well known as the Caucasian State Biosphere Reserve. Sochi offers a great variety of outdoor activities such as sailing, snorkeling, yachting, mountain biking, water rafting, climbing, caving, trekking and hiking. The most popular tourist attractions include the Sochi Dolphinarium, the Agura Waterfalls, the Summer Theater, the Matsesta Spa, the Sochi Art Museum, the Riviera Park, and the Botanical Gardens. Located at the base of the Caucasus Mountains, Sochi is a perfect place for winter sports of all types. Sochi is proud to have been chosen to host the 2014 Olympic Winter Games. Sochi has Sochi/Adler International Airport (AER), which is located 19 km (12 mi) south of city of Sochi near city of Adler.